The problem with the dilemma of religious rights vs. other rights is that we have completely lost the sense of natural law upon which the Common Law was built. Thus, there is no sense of how to balance religious rights versus other rights. And in this way genuine religious rights lose. Because our society is increasingly hostile to religion and doesn't even consider religion an essential component of Man. So it`s fine that we may make this woman take off this niqab -- this would not violate the natural law-- forcing a Catholic school to teach a religion course against their belief is a violation of natural law. It's not enough to be happy with a result. We must consider the reasoning through which a Court (or legislation) arrived at their conclusion. 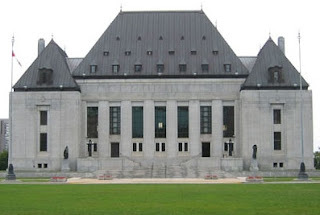 I'm somewhat pessimistic about the future of religious rights in Canada. If people don't adopt and practice religion, they won't defend it as a right. It doesn't matter what any human rights convention says. Legal rights aren't worth the paper they're printed on without a culture that upholds them. More on the story from Canadian Lawyer Magazine.